The sun warms your skin as you smudge sunscreen lotion on your cheeks and watch BBQ smoke curl in the air. With waves crashing in the distance and soft sand between your toes, nothing can beat this perfect waterfront day. Canada has more lakes than anywhere else in the world (over 2 million! ), along with graceful beach shorelines that curve into the sunset like a dancer’s arch. 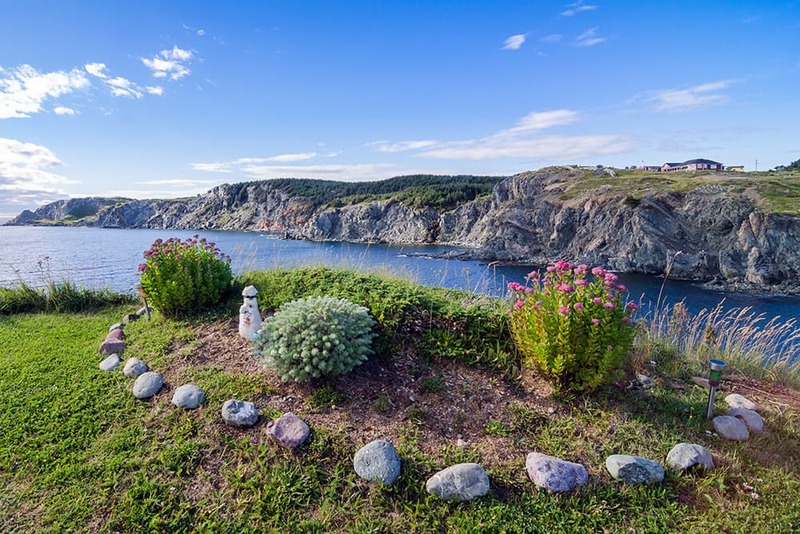 To help you find the best lakefront and coastal towns in Canada, we’re presenting the top spots in the country. 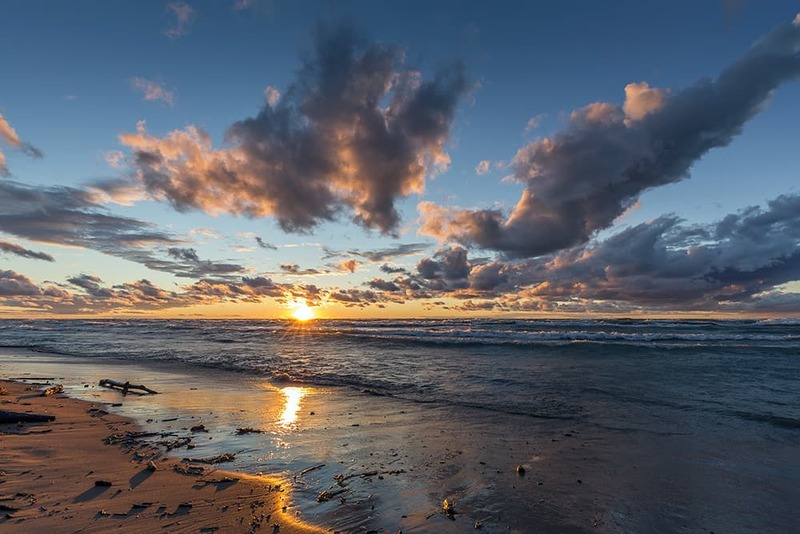 Grand Bend, Ontario, is an iconic summer destination. Located on the shoreline of Lake Huron, it’s full of places to stretch out your towel. There are also outdoor showers, volleyball nets, and a children’s splash pad. Need to dry off? There’s nearby Port Blake Beach & Day Park, which has picnic tables and BBQ pits. If you don’t want to do any cooking yourself, head to local favourite Smackwater Jacks Taphouse after your day by the water. Fun fact: The Ford Motor Company held one of their first company events here in the 1910s. You can’t mention summer destinations without mentioning one of the best beach towns in Canada: Long Point, Ontario. The sweeping stretch of sand bends around Lake Erie and the scene offers unforgettable sunsets. You can see the tangerine skies from the sand, or you can view them from your kayak. (Grand Experiences Canoe and Kayak Outfitter can help with a rental.) This beach isn’t just for thrill-seekers, however. It’s open to kids, sunbathers, and those in walkers and wheelchairs, as there are accessibility mats available. Tip: Take a fishing lesson with BAER Fishing Adventures to catch smallmouth bass and northern pike. Know where the longest freshwater beach in the world is located? Ontario! 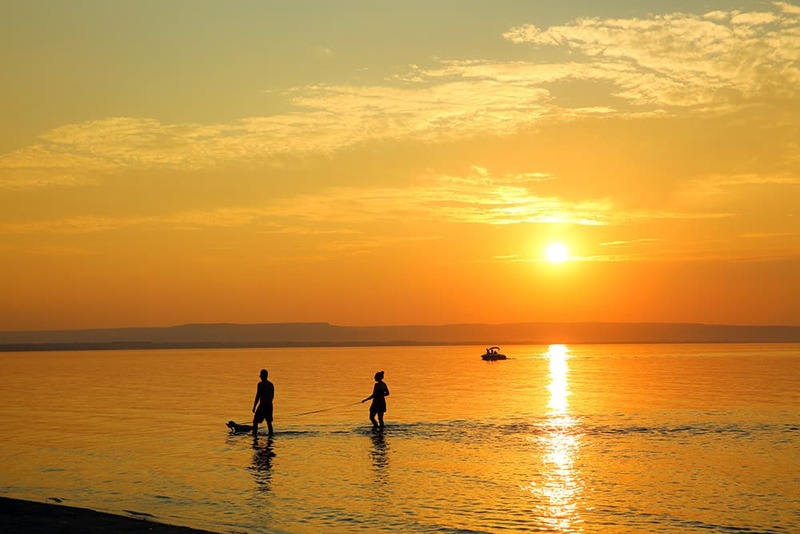 The 14 km-long Wasaga Beach is perfect for lounging with friends or reading a summer romance novel. Along with pretty waves, the shore is close to cycling and hiking trails. If you’re trying to pick a time to visit, choose one of the many festival weekends. To name a few, there’s Wasaga Beach Ribfest, 5K Foam Fest, and the summer-long Jazz & More in the Park. Tip: Sunscreen with an SPF of 15 blocks out 93 percent of UVB rays; SPF 30 blocks 97 percent. Bet you didn’t think there was a lake town in the middle of the prairies, did you? Grand Beach, located on the south banks of Lake Winnipeg, is a not-so-hidden gem in Manitoba. 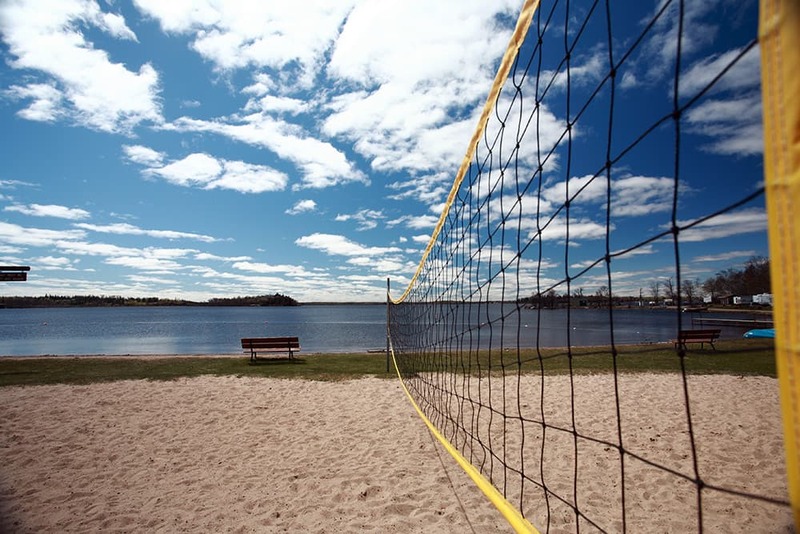 Check out Grand Beach Provincial Park for waves, picnic tables, and concessions stands. Plus, the boardwalk is nice for a stroll. When it’s time to eat, just head to Gray’s Station. Walk to the window in your swimwear and place an order for burgers, fries, and ice cream. Tip: Grand Marais Pier is the place to be at sunset. Look westward as the sky turns pink. Cavendish is one of the OGs of Canadian beach towns, and it’s a must-visit for Anne of Green Gables fans. You can even tour the house that L.M. Montgomery based the fabled gables on. 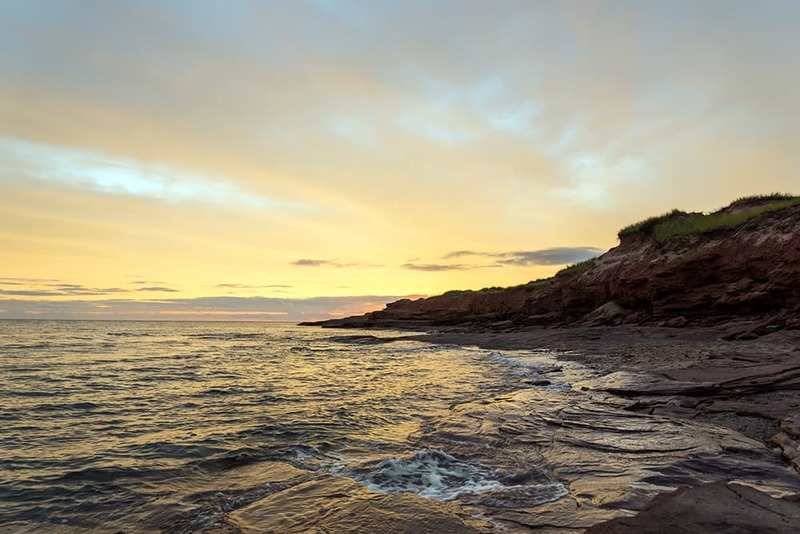 When you’re ready to see PEI’s signature red sand, take your pick between Prince Edward Island National Park, Cavendish Cliffs, and Cavendish Beach. The water at the beach is generally calm, and the boardwalk is perfect for a stroll. Tip: Enjoy a day of waterslides and attractions at Shining Waters Family Fun Park. If all you know about Twillingate, Newfoundland and Labrador, is icebergs, you’re missing out! The town has rocky beaches perfect for walking and building bonfires. In particular, French Beach is a popular spot in town. There’s also prime whale-watching around here, as Twillingate is home to the largest population of humpback whales in North America. Once you’re ready to chow down, make your way to Canvas Cove Bistro. This eatery is a part of Iceberg Quest, so you can combine a good meal with a tour of the area. Tip: Go to Long Point Lighthouse for the best vantage point of humpback whales. 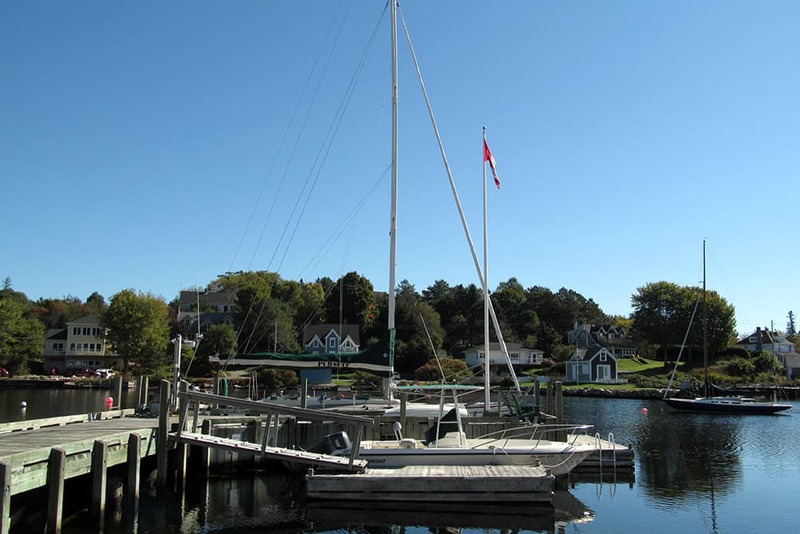 Known for its sailing culture, Chester deserves top marks on our Canadian coastal towns list. In mid-August, join Chester Race Week. This event dates back to the early 1900s, when regattas became more organized in the village. After burning all that fuel, you’ll want to reload on calories. Located on the docks of Front Harbour, The Rope Loft serves up surf and turf, pasta, and pizza. The building is over 200 years old and has served the village as many businesses over the centuries. Tip: In sailing, “port” refers to the left side of the vessel when facing forward; “starboard” is the right-hand side. 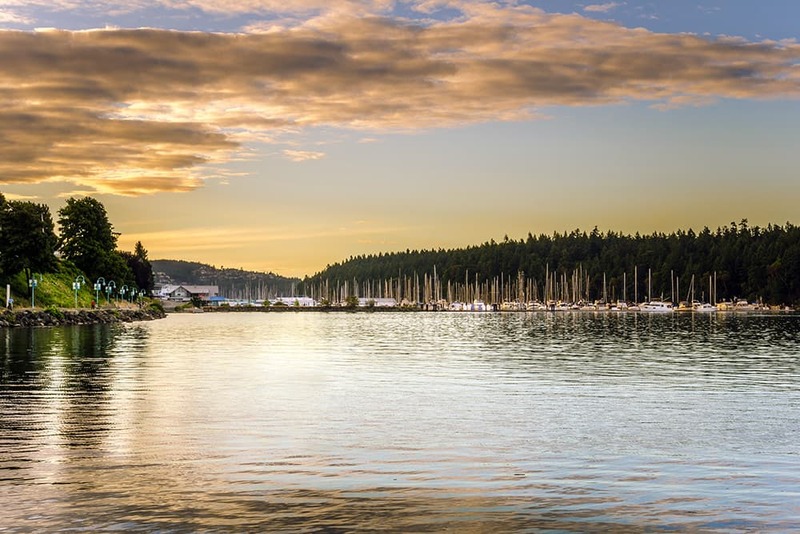 With the nickname of “Harbour City,” Nanaimo, British Columbia, is a perfect seaside town to visit this summer. Kayaking and sailing are popular in the area, but we’d recommend you push yourself and try some diving. Explore the shipwrecked HMCS Saskatchewan and HMCS Cape Breton, both of which sank near Nanaimo. If you want to see the coast up top, consider going on a day trip to Saysutshun/Newcastle Island. While you’re there, visit Saysutshun Bistro, which offers a fusion of indigenous and European-influenced dishes. Tip: You can make the short commute from Nanaimo to Saysutshun in a kayak. 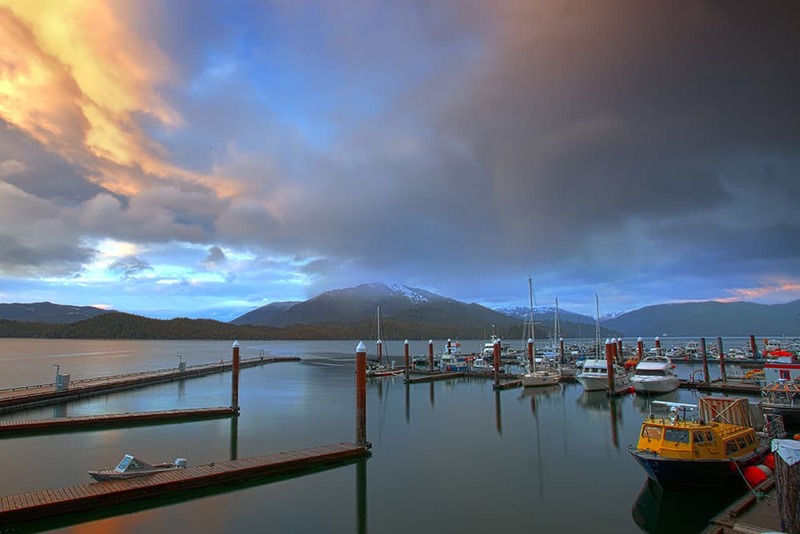 Once you step foot in Prince Rupert, you’ll understand why this is one of the best beach towns in British Columbia. Start in Cow Bay Marina, the town’s tourism hub and cultural centre. It’s home to several art galleries and the Museum of Northern British Columbia. After that, spend some time at Khutzeymateen Grizzly Bear Sanctuary, where you can observe the grizzlies and their lush habitat from safe viewing areas. The park is also culturally significant for the local First Nations and it’s used in ceremonies and community events. Fun fact: About 15,000 grizzly bears live in British Columbia. Salt Spring Island, British Columbia, is the perfect coastal spot for water sports. 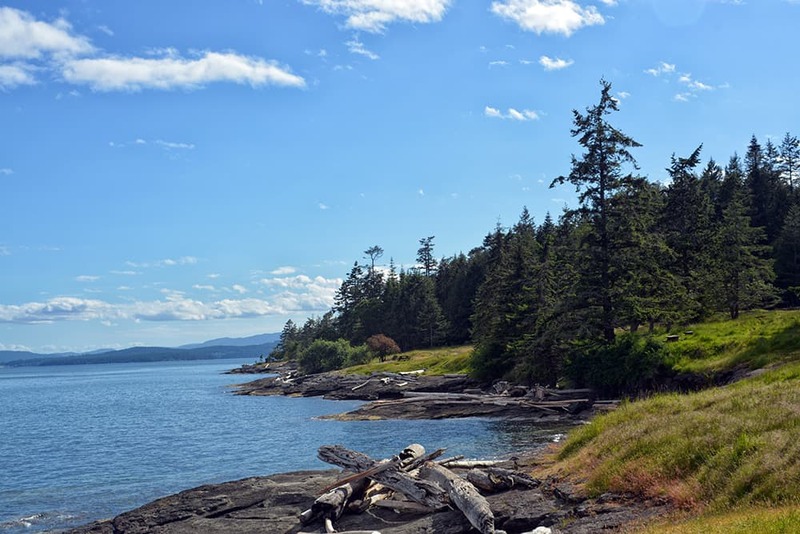 Sign up for classes with Salt Spring Adventure Co., which offers experiences for kayakers, paddle boarders, and whale watchers. Once it’s time to eat, dine on the waterfront of Ganges Harbour at Tree House Cafe. Patio seating and a fresh and hearty menu make every meal a community celebration. Tip: Tree House Cafe has live music every night during the summer months. Shediac is the Lobster Capital of the World, so get ready for good eats when you’re here. 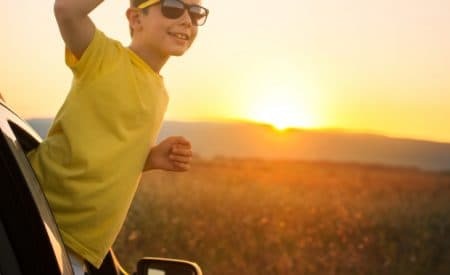 In particular, the Shediac Lobster Festival fills the town with kid-friendly fun, concerts, and mountains of lobster. After digesting, hit the beach! Parlee Beach Provincial Park has some of the warmest water in the country. When you’re ready for dessert after burning all that energy, head to Parlee Beach Restaurant. Tip: Parlee Beach Restaurant has all-you-can-eat fish and chips Tuesdays. Have fun at the beach, and don’t forget that sunscreen! Check out Sidney, Vancouver Island, BC. Bustling bayside community with great restaurants, amenities and friendly folk. Enjoy a meal or leisurally drink beside Sidney marina. Ummmm, you missed BC’s Okanagan Valley. A three province destination. Lakes and wine and mountains. 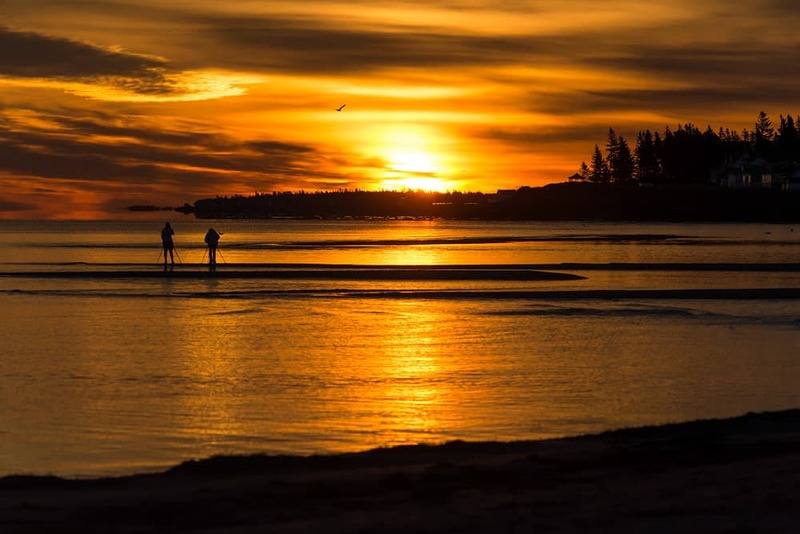 Parlee beach in Shediac NB has a huge problem with raw sewage being dumped into the water and the water quality being too low to swim in for days and weeks on end. Has been an ongoing problem for years. Not sure how it ended up on this list. 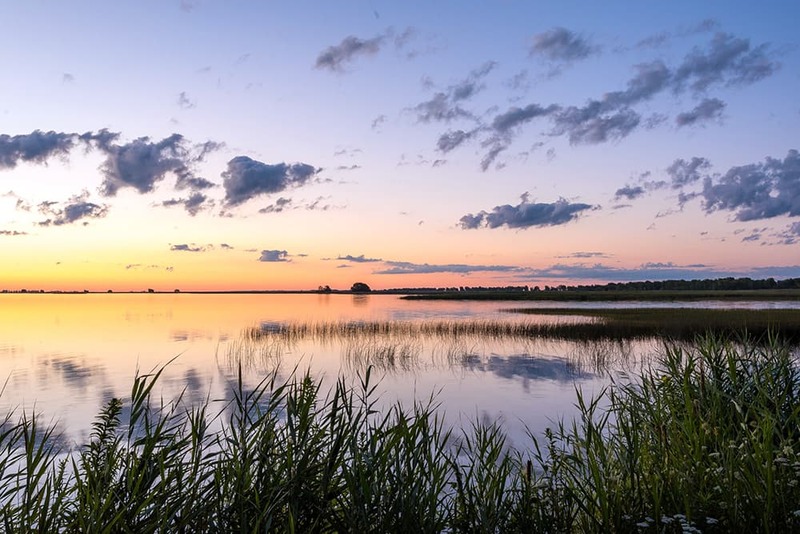 Try checking out Leamington, Ontario with Point Pelee National Park minutes away, beautiful Seacliff Park with accessible beach, volleyball courts, splash pad, it goes on and on! Come visit! Thank you for choosing Long Point Ontario. We think we are the best but are thrilled to be chosen as #2. How is Tofino. BC not on here? 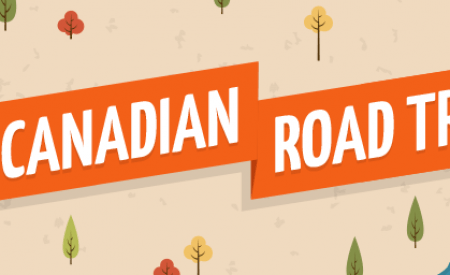 Literally the only surf town in the country, great restaurants, temperate rainforest, unique accommodations, and a national park, Love Grand Bend & Long Beach…. but simply by omitting Tofino, this list became garbage. Go to Grand Bend every year! Gotta say though, as a downeaster, what about St. Andrews by the Sea (NB) and St. Martins (NB)???? Parksville and Qualicum Beach, B.C. ???? Beautiful. Kincardine, Goderich, Southampton, and Port Elgin are also pretty nice on Lake Huron.